Warm homes and hearts with this set of all natural firestarters. These all natural firestarters are the perfect housewarming gift in more ways than one. 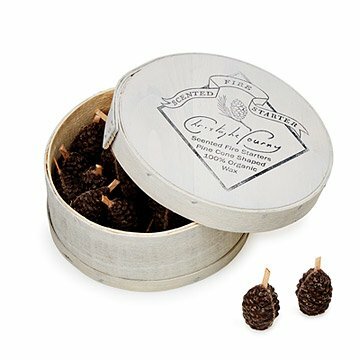 Whether you're starting up the grill or hearth, the organic beeswax and essential oil pine cones bring a deliciously evergreen scent to your homestead and come packaged in a rustic wooden box. Handmade by Christophe Pourny in Brooklyn, New York. Christophe Pourny was born and raised in the Var region of Southern France. Growing up in his parents antique store in Fayence made the love of furniture and artisanal technique second nature to Christophe. After university in Nice, and an apprenticeship at his uncle's renowned shop on the Rue Jacob in Paris, Christophe moved to New York to establish his own restoration studio. Over twenty years later, the Brooklyn based studio can count many celebrities and celebrated interior designers among his clients. His extensive work with New York's City Hall on the restoration of priceless antiques such as George Washington's writing desk are among his proudest achievements. His projects have been published in Elle Decor, Architectural Digest, The Financial Times, Martha Stewart Living, and other shelter publications. Read a Q&A with Christophe on our blog. Please note: This is not a candle. Only burn in a protected environment such as a fireplace or barbecue. Contains 20 pine cone fire starters.